The ongoing crisis in West Indies cricket may give Gautam Gambhir's India an edge in the five-match ODI series starting June 6, but winning in the Caribbean is far from easy. Ask Rahul Dravid, who apart from leading India to a Test series win in 2006, was part of the Indian team on the 1996-97 and 2001-02. While India didn't extract any series-winning joy on the 1996-97 and 2001-02 tours, the Dravid-led team won the 2005-06 Test series for the first time since 1970-71. It was India's first significant series win outside the sub-continent (barring the win against Zimbabwe in 2005) since 1986. "It is going to be a big challenge for Gauti. West Indies do play good cricket at home. We need to see what kind of team they put on the park. If they field all their top players, they are going to be a very, very competitive team. There is no doubt about it. It should be an interesting series for India," Dravid told MiD DAY on the sidelines of a promotional event at the Puma store in Bandra yesterday. Dravid stressed on the adaptability factor. "Conditions can vary from island to island so we need a bit of adaptability. Wickets are very different in Barbados, St Lucia and Kingston. The weather changes from one island to another. Adaptability is going to be important when you play there," said the former India skipper, who went on to win a Test series in England in 2007 after his Caribbean high. A lot of young faces from the IPL were expected to make the cut, especially after senior players like MS Dhoni, Sachin Tendulkar and Zaheer Khan were rested. But the selectors yesterday preferred players with some level of international experience. "The team has a good mix of players. A lot of them have played over 60 ODIs, so many of them are quite experienced. I see no reason why they shouldn't do well," he said. Will the differences between the West Indies Board and its top players have a bearing on the series' outcome? 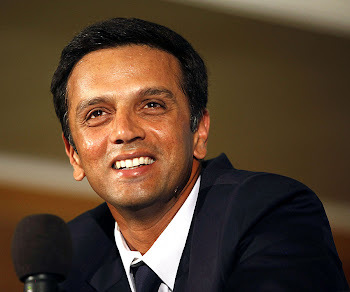 "It is hard to comment on something that you are not a part of," replied Dravid. "I don't know the internal politics of the players and WICB. From the WI fans' point of view, they would obviously love to see their top players playing."